goimports is a Go tool to remove unused and add missing imports. It also formats your code the same as go fmt. 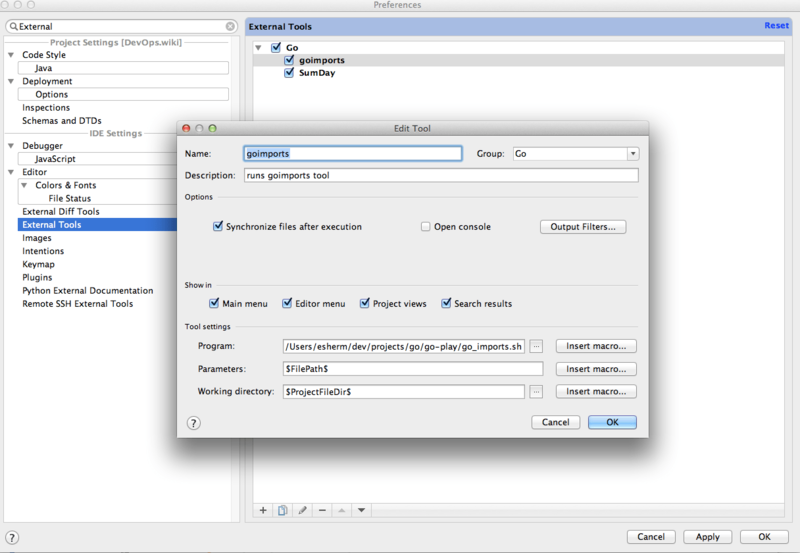 This is one solution for running goimports when saving *.go files in Intellij IDEA. If you have a better way (not involving snark about emacs), please comment. You’re probably using the golang plugin. That plugin isn’t necessary for this goimports-on-save business, but if you’re using Intellij to write Go code then you might as well use the plugin, too. Name the tool, uncheck “open console”, paste the full path to your shell script in the “Program” field, and add $FilePath$ in the “Parameters” field. It’ll prompt you to remove the default. Accept it. That’s it. Now, when you save your .go files, goimports will run and overwrite the contents of your editor. All other files are left alone. Hat tip to this stackoverflow answer for inspiration. Posted: March 30, 2014 March 30, 2014 . Posted in: Golang, Intellij IDEA, Programming. Bookmark the permalink.